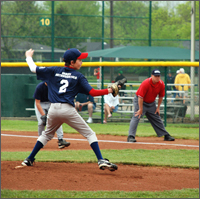 The Grove City Parks and Recreation Department invites local businesses, civic clubs and other organizations to sponsor the Grove City Little League® baseball program. Sponsorship is a great way to earn recognition in the community with 17,000 players, fans, officials and travel teams at Windsor Park annually. Our sponsorship plan offers team or custom sponsorship options. There are many unique ways to support the league, and valuable donor benefits associated with each contribution. For more information, download the Little League Sponsorship brochure or contact the Parks and Recreation office at 614-277-3050 to discuss sponsorship opportunities. Thank you to the 2018 baseball sponsors! Sponsorships are vital to the success of our youth baseball programs, supporting the Grove City Parks and Recreation Department’s ability to keep players’ fees to a minimum and improve the Windsor Park Baseball Complex. Please patronize our sponsors and thank them for their commitment to our community. A & J Lawn Care, Inc.